Eukaryotic cells are cells that contain a nucleus and organelles, and are enclosed by a plasma membrane. Organisms that have eukaryotic cells include protozoa, fungi, plants and animals. These organisms are grouped into the biological domain Eukaryota. Eukaryotic cells are larger and more complex than prokaryotic cells, which are found in Archaea and Bacteria, the other two domains of life. Eukaryotic cells contain a variety of structures called organelles, which perform various functions within the cell. Examples of organelles are ribosomes, which make proteins, the endoplasmic reticulum, which sorts and packages the proteins, and mitochondria, which produce the energy molecule adenosine triphosphate (ATP). They also have a true nucleus, which contains the genetic material DNA and is surrounded by a nuclear envelope. All of the organelles are stabilized and given physical support through the cytoskeleton, which is also involved in sending signals from one part of the cell to the other. In eukaryotic cells, the cytoskeleton is composed mainly of three types of filaments: microtubules, microfilaments, and intermediate filaments. The gel-like substance that surrounds all the organelles in the cell is called cytosol. The figure below shows the structure of a eukaryotic cell; this is an animal cell. 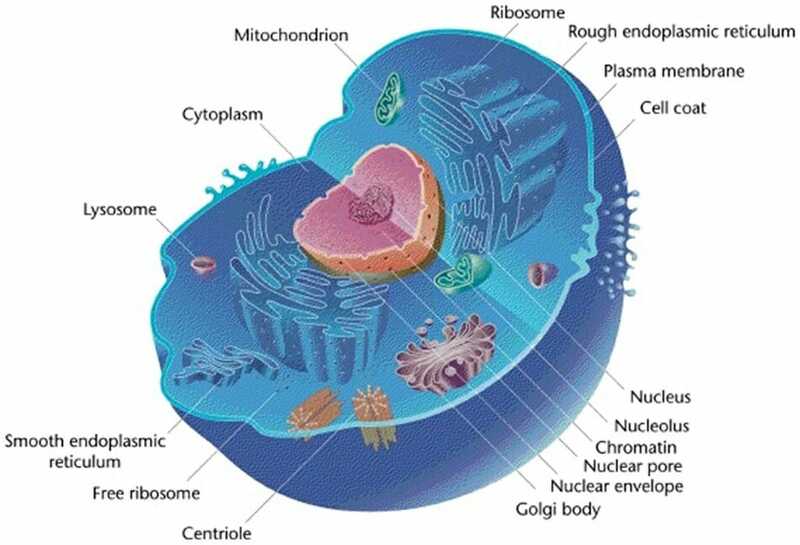 The nucleus and other organelles are shown. The cytosol is the blue substance surrounding all of the organelles. Together, the cytosol with all organelles besides the nucleus are grouped as cytoplasm. Cell – The basic biological unit of living things; they can be either prokaryotic or eukaryotic. Mitosis – Part of the cell cycle, it is the process by which a cell replicates itself. Eukaryote – An organism whose cells are eukaryotic. Organelles – Specialized structures inside cells that perform specific cell functions. 1. What are the three parts of interphase in the cell cycle? A is correct. The three parts of interphase are Gap 1 (G1), a growth phase, Synthesis (S), during which DNA replicates, and Gap 2 (G2), a second growth phase in preparation for cell division. Quiescence (G0) comes before interphase, while mitosis (M) comes after interphase. 2. Which is a possible characteristic of a eukaryotic cell? D is correct. Plant cells have cell walls that are mostly made of cellulose, while some fungi cells have cell walls made of chitin. Animal cells have no cell wall, just a cell membrane. Plant, fungi, and animal cells are all eukaryotic cells. 3. What are the stages of the cell cycle in order? C is correct. The cell cycle starts at G0, or quiescence. It then goes through the three parts of interphase: Gap 1, Synthesis, and Gap 2. The last stage of the cell cycle is mitosis.